A pair of often overlooked national monuments — one of which is considered sacred to the Hopi, Zuni and Navajo people — are located just a short hop off of Interstate 40, about 13 miles north of Flagstaff. Sunset Crater Volcano (www.nps.gov/sucr) offers a look at the results of an ancient eruption, while neighboring Wupatki (www.nps.gov/wupa) gives visitors a glimpse into the past, when Pueblo Indians inhabited the area. A 35-mile loop road, which connects the two monuments, is easily accessible from Highway 89; and the sites make an interesting stop on the way to or from the North Rim of Grand Canyon National Park. When approaching the monuments from the south, Sunset Crater Volcano is the first stop along the loop road. The visitor center, which is located just outside the national monument boundary, is a good place to get an overview of the area and pick up a map. Access features include accessible parking in front, barrier-free access to the building and accessible restrooms inside. 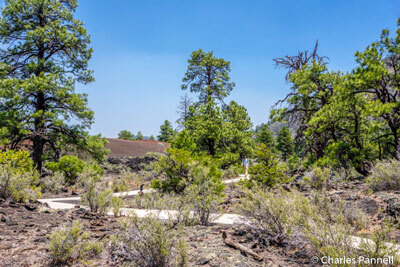 Just up the road, you can get a closer look at the Sunset Crater cone along the Lava Flow Trail. Although the entire length of the trail is not accessible, a quarter-mile paved loop is wide and level, and dotted with benches. Halfway along the trail there’s an accessible viewing platform which offers a good look at the mountain that exploded over 900 years ago. Along the trail you can spot signs of the eruption, such as limestone fragments that rose with the magma and are now embedded in the surrounding rocks. Accessible picnic tables and restrooms are located back near the parking lot, so this site also makes a good lunch stop. Continuing along the loop road, you’ll pass the Cinder Hills Overlook, which is worth a quick stop. There’s no marked parking, but there’s usually room enough to park an accessible van, get out and get another view of Sunset Crater. Up the road, Painted Desert Vista has accessible parking with curb-cut access out to the overlook. On a clear day you can get a nice view of the Painted Desert in the distance. Accessible pit toilets are located in the parking area, and although there is a picnic table on the dirt, it’s not accessible. The most accessible picnic area is located back at the Lava Flow Trail, so plan ahead if you pack along a picnic lunch. 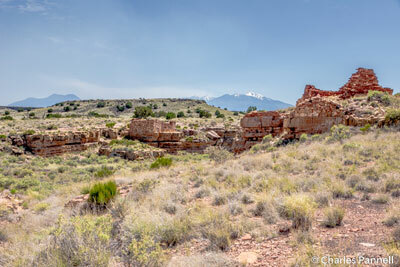 The loop road continues along to Wupatki National Monument, with a few pullouts along the way for photo stops. As you reach Wupatki, the scenery changes dramatically. The elevation drops 2,000 feet, and the Ponderosa Pine dotted hills give way to red rocks and a painted desert landscape. Ruins of ancient pueblos can be found in rock outcroppings throughout the monument. The first pueblo you’ll see is Wukoki Pueblo, which is located near the south entrance of the monument. Take the first right and continue along the road for about three miles until you reach the ruins. There’s a small asphalt parking area without striping, and accessible pit toilets nearby. You can get a good view of the 800-year old ruins from the parking lot, but the access out to the site is blocked by a large step. 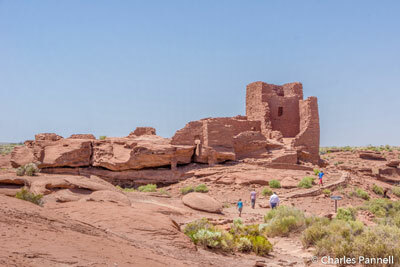 This Hopi site — which was named for the word for “big house” — was occupied by three families from 1120 to 1210. Back out on the loop road, the visitor center is the next stop. There’s accessible parking in front with level access to the building, and barrier-free access to the gift shop, ranger information desk and accessible restroom inside. An accessible picnic table is located in the front, and there’s level access to the accessible Loop Trail in back. 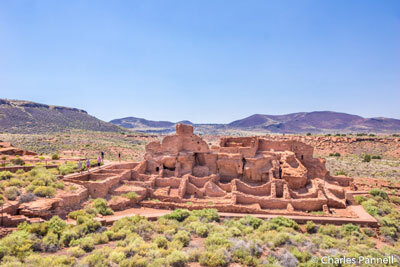 The half-mile trail overlooks the largest pueblo in the monument — Wupatki Pueblo — and offers wheelchair-users and slow walkers an excellent view of the ruins. This 100-room pueblo was occupied by 85 to 100 people in 1182, and it also contains a community room and a ballcourt. And although this sacred site is not physically occupied today, the Hopi people believe their ancestors remain there as spiritual guardians. Sometimes you can almost feel their presence. Several other pueblo ruins are located at the other end of the monument. Citadel Pueblo is on the left, and although you can get a gander at it from the parking area, the steep .2-mile trail out to the site is not accessible. There is a shorter trail to the Nalakihu ruins, which is located next door, but it also presents some obstacles for wheelchair-users and slow walkers. Still, you can also get a nice view of it from the distance. The Lomaki site, which is located near the exit, features accessible parking with accessible pit toilets nearby. A half-mile hard-packed dirt trail covered in crushed gravel leads out to the ruins, but the entire length is not accessible. The first part – about .1-mile out to the Box Canyon ruins — is doable, but after that the trail gets steep and loses its access. Still it’s worth the short walk to the first site, but be sure and wear sun protection as there’s no shade and the desert sun can get intense. As you near the exit to Wupatki National Monument, the loop road reconnects to Highway 89, about 15 miles north of the entrance to Sunset Crater Volcano National Monument. Although it’s a slight detour, a visit to these monuments offers an excellent opportunity to discover the history of this scenic slice of Arizona. As an added bonus, it’s rarely crowded, and that fact by itself helps visitors get a real sense of what it might have been like 1,000 years ago.